You've searched the internet for the best summer holiday location and you've saved yourself a small fortune by booking earlier with a low cost flier. However, your holiday ends up costing you a packet before your plane even takes off. How? Follow our cost saving advice and avoid the unforeseen expenses that can make summer holidays so costly. If you are travelling to the airport, plan your journey in advance and think about whether you are getting value for money. The Gatwick Express for example might be quick, but it is also expensive. A standard return ticket to Gatwick from London Victoria will set you back around £30, and a Heathrow Express train from London Paddington costs £32 for a return. The Southern Train service can cost as little as £10 for two single tickets to and from Gatwick if you book in advance. Think about taking the tube or a bus instead. A single tube ticket from Zone 1 to Heathrow will set you back just £4, while a Terravision bus from Liverpool Street Station to Stansted will cost just £13 return. Remember though that traffic may interfere with your travel plans so give yourself plenty of time to get to the airport. If you are planning to travel by car, remember to book well in advance to get the best prices. You can save yourself at least £5 off a one week's stay at Manchester Airport simply by booking before you get there. Visit www.airport-parking-shop.co.uk for quotations on a range of different car parks close to your terminal. If you are planning on using your debit or credit card abroad, remember that most big banks like to charge a 'foreign loading fee' of around 2.75% for each transaction. Using a cash machine will also cost you something in the region of 1.5% for each transaction, with a minimum fee of £1.50. Better to change your money before you go. However, if you are planning to purchase foreign currency before you go, make sure that you don't end up paying more than you need to. For example, if you pop into your local Post Office and try to pay for currency with a debit card, they will charge you a 2.5% fee for doing so. The easiest way to avoid this is to just withdraw your money from the nearest ATM and pay for your currency with cash instead. Once abroad, you may find some shops try to persuade you with something known as 'dynamic currency conversion'. This simply means that the shop will let you pay for items in Sterling rather than the local currency. Bear in mind though that the exchange rate you will get will be poor and you will end up paying more for your goods than you would if you paid by local currency. Avoid this rip-off if you can. Most travellers like to purchase a guide to the place they are visiting before they go, instead of spending between £10 and £20 on a glossy guidebook, try a search on the web. Try visiting the website www.ivebeenthere.co.uk where you can get information for great ideas on locations, hotels, tourist attractions and restaurants. Most online newspapers also have dedicated travel sections and guides that you can print off and bring with you. It might also be worth visiting your local library for travel guides and maps. Holiday insurance is extremely important, but that doesn't mean you should have to pay over the odds for it. If your holiday insurance is almost about to expire, don't renew the policy. Make sure that you obtain as many quotes as you can an insure yourself for the most appropriate amount you can afford. Make sure that cover restarts in time for your trip. If you are travelling to a European country, make sure that you have a European Health Insurance Card (EHIC). If you are taken ill while in another country, this card will provide you with the same state-assisted healthcare as a normal resident. Visit the EHIC site for details on how to apply for an EHIC card. If you are planning on hiring a car while you are abroad, try to get insurance to cover the hidden extras such as the 'Collision Damage Waiver' that hire firms love to charge unsuspecting customers. Some firms will charge you a starting price of £49 a year (for cover within Europe only) that could knock off charges such as CDW that can cost up to £30 a week. Most on-board sandwiches are soggy, unappetising and expensive, usually costs around £5. If you are feeding a family of four on a flight these sort of prices can leave a nasty taste in the mouth. Instead, buy your sandwiches before you get on board, and to make the most savings, avoid buying your food at the airport altogether and bring it with you. Sometimes the most expensive items aren't the best. A recent Which? 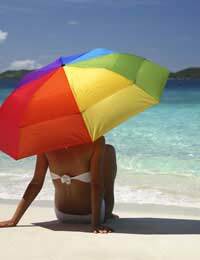 survey suggested that buying costly suntan creams is a luxury that we all could do without. Supermarket-own brands from Sainsbury's and Asda performed equally as well in sunlight tests compared to their more expensive rivals. So, ditch the brand name and save yourself a packet.